CRAZY DISCOUNT! Was: $139.95 Now: $89.95! If you need more room to store your books and ornaments, this 4 tier ladder shelf is just for you. 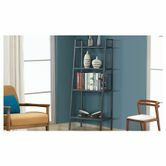 With two ladder-style bookcases boasting four shelves each, this set is great for adding more vertical storage to your living room, bedroom, or office space.